At the end of a very intense working year with the publication of my book, Songwriters Speak, and a brief, eye-opening stint working for Apple Computer, I took myself for a short break to Hawaii for some R&R. It was only 10 days, but it was just what I needed. 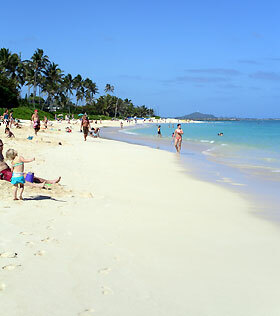 For my third Hawaiian visit, I decided to split my time between the North Shore of Oahu, which I'd discovered in 1999, and Waikiki Beach, which I hadn't seen since 1978! 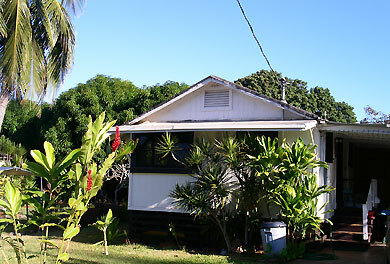 I rented a funky private cottage just up the road from Waimea Bay, a short drive from Haleiwa town. Just a few houses back from a beach, it was a perfect little retreat to spend a quiet Hawaiian Christmas, away from the commercialism of crowded places. The only crowds on the North Shore were at the shave ice stores! My lovely landlady, Katie, made sure the cottage was equipped with all I needed, and even hung a Hawaiian stocking full of treats on my door on Christmas morning. 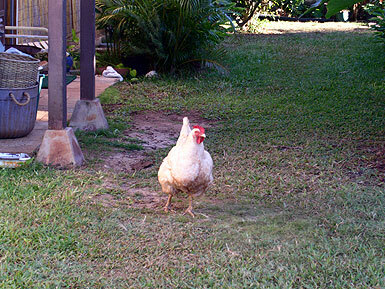 The Hawaiian Hideaway was very down-home, right down to the tropical chooks wandering around the yard. I wasn't in the mood for cooking on this holiday, so my fine feathered neighbour was spared any concern! In 1999 when I'd stayed in a house near Haleiwa, I'd spent a beautiful day at Waimea Bay and was really looking forward to being there again. What I should have realised, but didn't take into consideration when booking, was that Christmas is winter, and winter on Oahu means huge surf on the north shore. The biggest surf you'll ever see. Traffic-stopping, jaw-dropping, breathtaking surf. Which makes for great spectacle, but for someone like me who just wanted to paddle in the calm ocean, this was not what I was looking for! 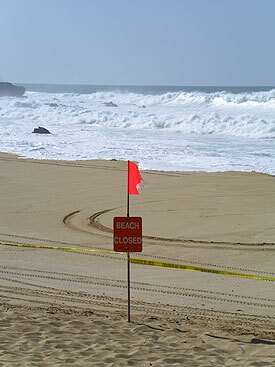 Beaches taped up, sunbathers unable to even step in up to the ankles for fear of being washed away. Look but don't touch. Most frustrating. The weather was as spectacular as the waves, so I sat on the sand getting tanned and studying the mindboggling big waves. Even these photos don't quite convey the full idea. 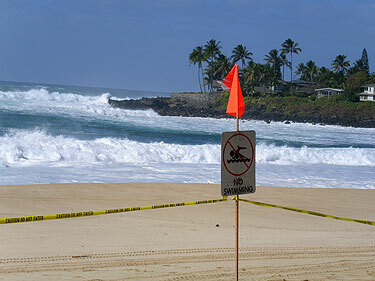 All along the North Shore it was the same  Sunset Beach even more thrashing. So I had to seek alternatives for getting myself wet. And I don't mean taking a cold shower! 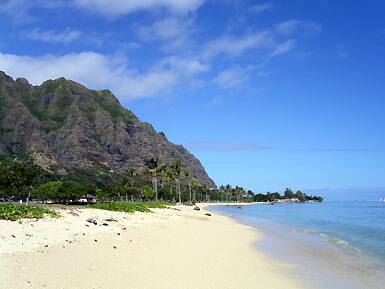 A few locals told me about Lanikai, a pleasant drive down the windward side of Oahu. 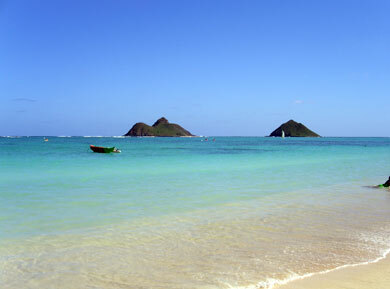 I'd driven down that way, as far as Kaneohe, in '99, but hadn't been to the town of Kailua, where Lanikai Beach is located. So I headed down there for a day trip and discovered this most exquisite spot, a sight for my very sore eyes. Ahhh... time to get wet. This was a seriously blissful day. 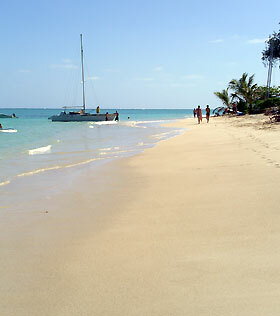 The beach was full of tourists and locals enjoying their Christmas vacation, but it didn't feel at all crowded. 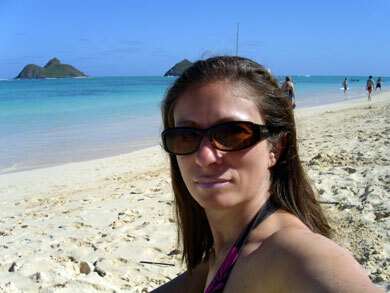 I knew that one day I would have to come back and spend more time at Lanikai, which I did in 2008. On another day I took another drive in the windward direction, this time not quite as far. Kualoa is a very special, sacred part of Hawaii. Back from the beach there is the huge Kualoa Ranch, which is a major tourist attraction. 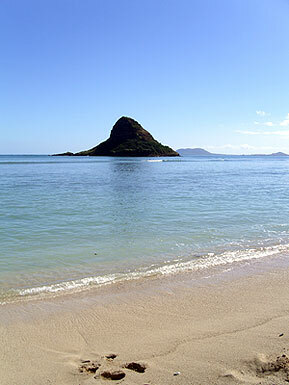 But all I was interested in was the beach, with its long stretch of sand and Mokoli'i Island just offshore, also known as Chinaman's Hat. 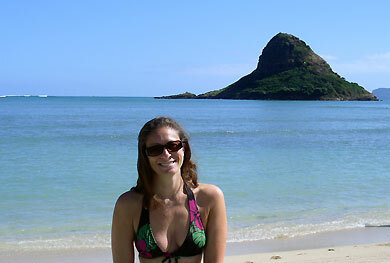 Deb tries on a Chinaman's Hat for size. 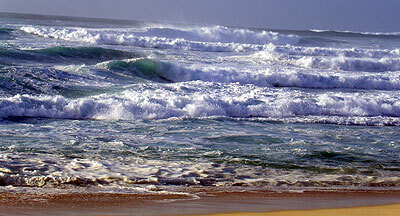 Back on the North Shore, I didn't let the big surf get in the way of having a fantastic time. Eating and shopping in Halewia, driving around to check out the waves at the different beaches, and watching the glorious sunset at Shark's Cove... it was all magnificent. After five days on the North Shore, I headed down to Waikiki Beach where I'd booked myself into the Hyatt for five nights. Waikiki was full at this busiest time of the year, but the crowded feel didn't take away from the mellow magic that Waikiki exudes. I had not been here since I was 15, on holiday with my parents, and my memories didn't do the place justice. 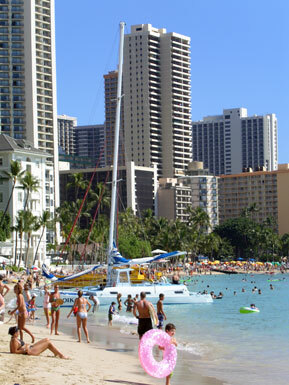 Waikiki proved to be much better than I ever imagined! 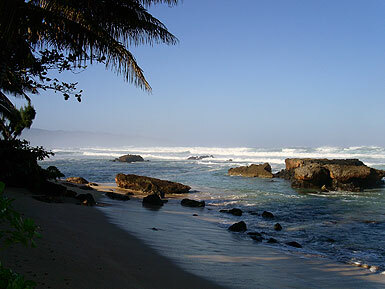 No surf, endless sky, unlimited sunshine... wonderful! There was nothing to do but relax on the beach, day after day. Well, when I wasn't shopping. Or eating coconut shrimp and drinking pina coladas. 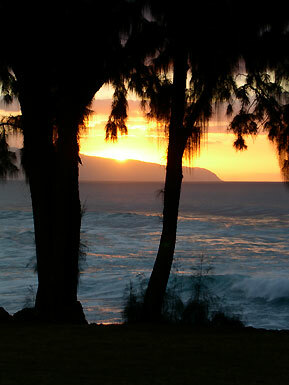 My favourite spot was directly in front of the Pink Palace, the Royal Hawaiian. I'd stayed there with my parents in '78, but such decadence was out of my reach this time. I was happy just to use the hotel's toilets during the day, eat coconut shrimp and drink pina colada at the Mai Tai Bar at night, and pose for a picture in front of its perfect pinkness. 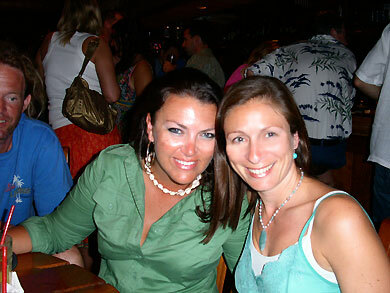 At night, the hottest spot on Waikiki was Dukes Bar at the Outrigger on the Beach. There I met a group of funlovers to hang out with over the next few days. 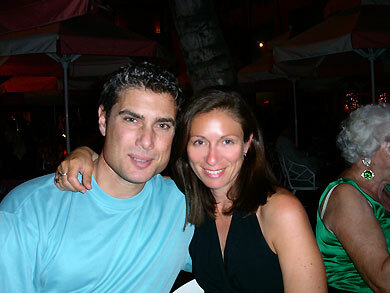 Justine, pictured here with me, was already a Waikiki regular. She couldn't stay away, coming back every few months. Turns out we had plenty in common, living close to each other in Sydney and both being PR chicks. We have since stayed friends. 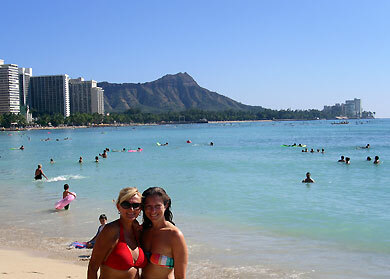 This is me with Linda, who hailed from somewhere in the American south, with Diamond Head dramatically behind us. And here I am with Jean Paul, whom everyone called Frenchy. He came from Strasbourg and was spending a month at Waikiki, getting seriously brown. Although I was actually developing a nice tan, Frenchy made me look pasty white! Merci. On New Year's Eve I hung out with a dashing Californian named Terry, who shared a few drinks with me at the Mai Tai Bar and we watched the fireworks on the beach together at midnight. Nothing as bombastic as the Sydney fireworks, and thank goodness for that! And then New Year's Day 2006 was my last day in Hawaii, which I spent... as usual... on the beach. It had been a wonderful little break from the rigours of life in Sydney, and I hoped I would get back sooner than later. It took two and a half years, but when I got back, it was for a 26-day stay. You can check out the details of my 2008 visit here.